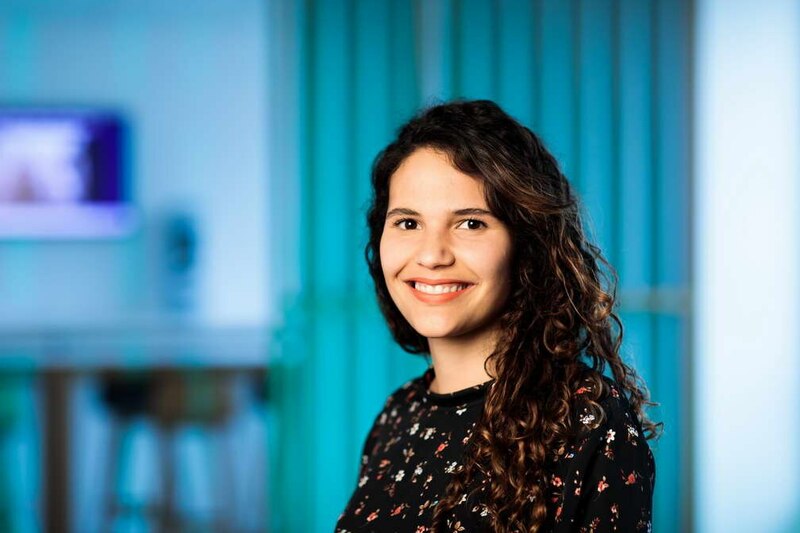 Initially from Colombia, Jennifer Diaz first moved to France to improve her French speaking skills. After deciding to stay in France and complete her master’s in marketing, Jennifer sought out a new challenge as an Essity GO! Graduate in France. A few years later Jennifer is now a Brand Manager for Essity. Jennifer took some time out of her busy schedule to speak to us about her career journey and how her start as a graduate assisted in both her personal development and her role as Brand Manager. Q: Hello Jennifer, thank you for taking the time to sit down with us. Can we start off with hearing a little bit about your role as a Brand Manager? Hello and yes, of course. As a local Brand Manager, I’m in charge of building and executing 360° action plans to ensure successful product launches: media planning (digital & TV sponsoring), promotions, PR activations, etc. I’m in constant collaboration with the our mills, commercial, financial & demand planning teams, as well as European & Global teams, to evaluate all launch factors (technical, pricing, promotional plans, profitability, etc). I’m also in charge of managing the brand’s performance & results, following-up the brand’s P&L, forecasts and budget. There are lots of different skills I have to use each day, so it keeps me on my toes! Q: What is the “thing” you like most about your current role? I really like working closely with several teams, all of which have different backgrounds and fields of expertise. It gives me a much more complete view of the overall strategy and allows me to learn about different functions. So, I guess my favorite “thing” is that I work in a really wide network of like-minded people which is really nice. It’s both professionally and personally enriching. Q: You started at Essity in the GO! Graduate Program in 2015, how did you find the Graduate experience at Essity? The 2-year graduate program at Essity was really exciting. I was able to travel during my role which gave me the opportunity to try out several different functions within marketing and sales and to acquire a broader business understanding. This flexibility also helped me decided what kind of role I enjoy most and where I would like to develop career wise. The fact of having a mentor was very helpful as well, since they give us very valuable career advice and guide us through our experience. I also had the chance of meeting other graduates that were also very passionate and committed to the company. We worked within the same category and we wanted to exchange best practices and make friends with experiences similar to me. We are still in contact and we see each other also outside work, which is really nice! Q: Do you feel like your graduate experience prepared you for the role you are doing now? Yes, of course. Discovering and experiencing different aspects of the business in a relatively short period of time gave me the opportunity to strengthen my marketing and business skills quickly. A lot of the skills I started to develop in the graduate program have been necessary for the role that do today as a local Brand Manager. I learned loads about working across functions, experience working in international teams and being part of some really exciting and large-scale projects. I also had the opportunity as a graduate to receive several training's throughout the program, which gave us even more confidence in carrying out any tasks that came in front of us. Q: Did you always plan to do a graduate program or was It a “right time and place” experience? I was looking to have a first work experience within marketing in an international company and I saw an offer on the GO! Graduate Program at Essity that immediately interested me. It was not only a marketing experience within a truly international company, but I would also have the opportunity of discovering other functions and to obtain valuable trainings with other graduates all over Europe. Q: When you finished the Graduate program, what made you want to stay with Essity after the program ended? Towards the end of the two years I had the opportunity of being part of the launch of Lotus Baby. To me, this was hugely impactful as this was an entirely new product launch. The whole process and project was very exciting, it was definitely something bigger than I had done before and I really felt like I was part of something wider. I had been part of this project at an early development stage, and I wanted to participate to the roll-out and launch phase, so I took this great opportunity and its always stuck in my mind since then as an inspiration. Q: How has your role changed from the Graduate role you started with back in 2015? I definitely have more responsibilities and a clearer and broader understanding of the French business. As a graduate you have more of a safety net and people expect and courage you to try new things. That’s still the same in my role now there is just less of a safety net as everybody has trust in your skills and experience. The graduate program was a key contributor for this to happen. Q: Work-life balance is very important to us at Essity, has this been reflected in your experience so far? I personally believe that finding a work-life balance is very important for everybody also. In my experience Essity has been is very considerate in helping people find the right balance between work and life. The correct balance ensures everyone is motivated when getting up in the morning and coming to work. This is reflected within our teams, we don’t always discuss about work and we take the time to meet also outside working hours and get to know each other personally. Having a tangible connection to the people you work with and the people around you is very important. Creating those bonds always produce more efficient, happier and productive teams in my experience. Q: What advice would you give to somebody considering joining Essity? Essity has been a company that has given me opportunities to grow , keep learning to improve my skills and keep developing my career in the direction I want to go in. I would advise the person to have courage, to be passionate, to be a team-player and to dare to take challenges.